My favorite search data tool is Google analytics, but it looks like I'll loosing some days maybe weeks using this new Google Insights for Search. I guess the really intersting thing is can Google be trusted the provide accurate data... the manipulate and fudge everything else, why not this too? Noticed that. Kinda nice to hopefully have more accurate data. As they say - paralysis by analysis. 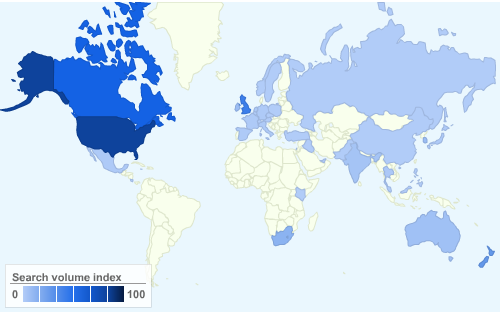 Is the data accurate (do we trust Google)? If so, how do we profit from this knowledge? If new keywords are trending up, do we then optimise to those keywords....ranking changes based on new links/new content can take weeks to take effect, by then those keywords may be trending down and other newer keywords are gaining popularity. The "freshness" factor has minimal long-term gain (by its very nature) - should we rank well for topical keywords only to have to keep changing our content to keep on top of what's new and topical? It seems that whatever you do to your site, you are behind the trend unless you predict the trend yourself. I think this type of tool is nice for mining new phrases and deeper keywords if you publish content on high authority domains that rank for whatever they publish content about. Have the search volume estimates for Google's keyword tool proved to be anything close to accurate? Or is this not really more helpful than the green bars they used to show (though people like numbers better)? 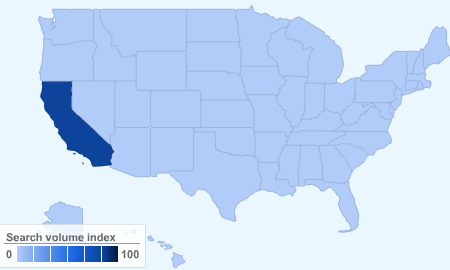 but shouldn't Google be able to actually show us somewhat accurate numbers? Or are they're estimates WAY off, too? I'll be posting an update with July's figures this week, but here's a spoiler - they change, but still aren't very accurate! Nice review Matt...seems like a good strategy might be to always have a couple one word campaigns that are used to track the accuracy of such tools (and any new tools Google releases). On some queries they are a bit off, but generally they are fairly accurate. 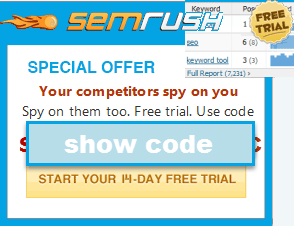 I found this tool really useful for keyword research and searches. I used to do this kind of research on adcenter labs, Adwords Keyword Tool and also Google Trends. I´ll be watching closely for deep analysis on this tool to find how reliable can it be. yes its a nice tool but here is something i would like to share.. i did a keyword analysis on adwords tool where it showed me the avg search volume on KW1 > KW2 but when i searched for the same two keywords on Insights, its just the opposite!!!! I dont know which one to believe. Is this because the data shown in Insights is 'relative' and not absolute? Also, on digging how the data is being scaled Google says that “When comparing multiple search terms, each subsequent term will be scaled relative to the first one entered”, however, even when I switch the positions of the keywords it still shows me the same values. Don’t you think if the relativity depends upon the keyword first entered, it should change? any help is much appreciated. my whole exercise of keyword analysis of the past week seems to dissolve in thin air.. 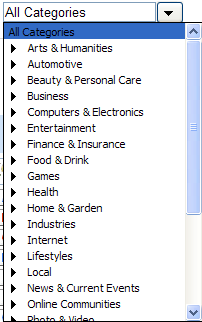 I think their regular keyword tool allows you to look at exact match search volumes. 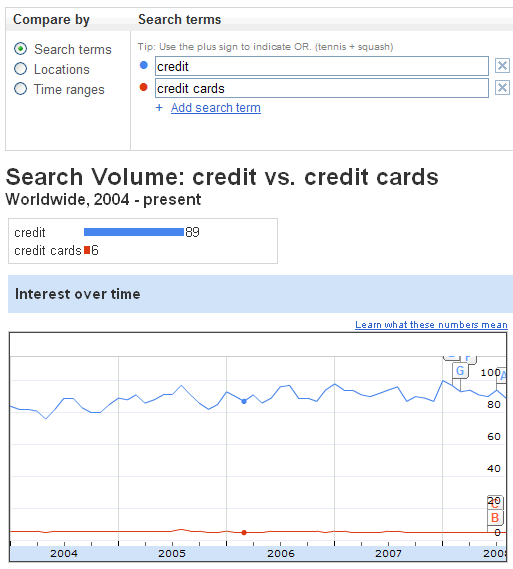 This tool computes broad match volume (so a search for credit cards shows up under the word credit as well). There were several keywords I've tried searching in Market Samurai at the beginning of a new project. It seems the software gets stuck forever and ever and never fetches any keywords. Is anyone else having this problem? One of the keywords I've tried is "cooking"
Is it because it's too broad for initial keywords search? Or...does it have to do with time of day (US - evening) when there are more people using the server?